Sharla has had a love for travel for as long as she can remember developing her passion for other cultures and cuisines at an early age. Sharla has been around the world including France, Italy, Spain, Ecuador, Ethiopia, and Japan to name a few, with the Galapagos Islands and Pompeii in Italy ranking near the top of her list of favorite places. Prior to her joining MEI-Travel, Sharla spent several years with a non-profit organization where she planned retreats and mission trips from the ground up often joining the groups on those trips. That experience and knowledge has proved infinitely valuable and Sharla puts it to use daily as she helps others plan their dream vacations. 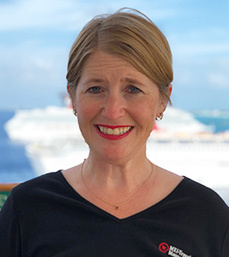 Sharla is a Certified Travel Counselor and Master Cruise Counselor and can assist with any vacation around the world- from a large family reunion to a solo trip, Sharla has the experience to ensure you have the best, hassle-free trip possible. When she’s not helping plan travel or traveling herself, Sharla enjoys spending time with her family or going for a run. Contact Sharla any time to start planning a great vacation!